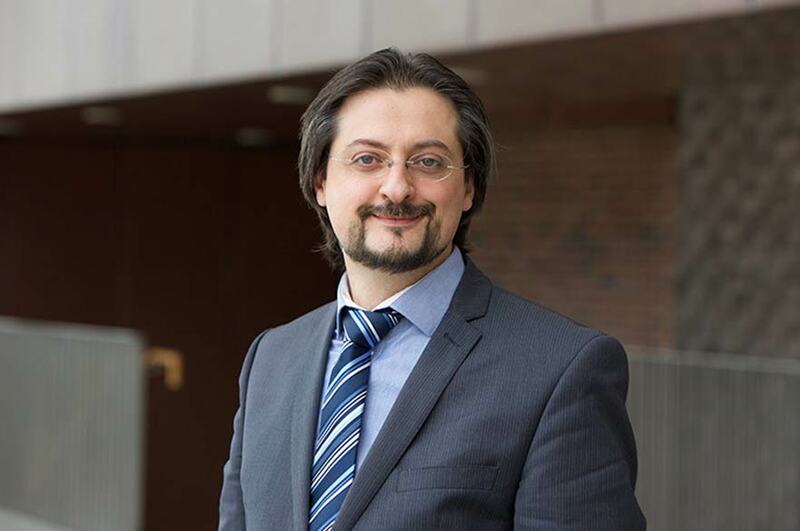 Dr Koutsogeorgis' responsibilities include teaching, both at undergraduate and postgraduate levels, as well as academic and industrial research. He is a Module Leader, a Placement Tutor, a Project Supervisor (Final Year and Masters), a Director of Studies for several PhD programmes, a Research Group Leader (Electronic and Photonic Materials Research Group - for research interests and activity please see the relevant tab) and finally the NTU Laser Safety Adviser. Dr Koutsogeorgis has been one of the founding members (in 2006) of an initiative for providing industry with direct access to the expertise of his Research Group at NTU, via "Thin Film Services" (TFS). This initiative was succeeded by a wider initiative "Scientific Services To Industry" (SS2i), covering the whole School of Science and Technology at NTU. More recently he has been a founding member of the iSMART facility (Innovations in Surfaces Materials And Related Technologies), a new SST / NTU initiative serving as an interface between Academia and Industry, carrying out consultancies and direct research, funded by industry. In the past, Dr Koutsogeorgis has served Nottingham Trent University as an Academic Board Member (2007-2010 and 2010-2013), a Health and Safety Adviser, a Direct Entry Admissions Tutor and a panel member on Course Validations. Also he has served as a University and College Union (UCU) official, with the roles of the Health and Safety Representative and a local NTU Committee Representative. Dr Koutsogeorgis graduated from the University of Ioannina, Greece, in 1997, with a BSc in Physics. He then moved to Nottingham Trent University as PhD candidate (Research Assistant) in the Electrical and Electronic Engineering Department and was awarded a PhD in 2003 ("Investigation of laser annealing of phosphor thin films for potential luminescent devices", Nottingham Trent University, 2003). He joined NTU in 2000 as a member of the research staff (Research Associate) funded by industry, and in 2002 he became a Lecturer. He had a short career break from August 2003 to September 2004 and upon return, he resumed teaching and research activity. In 2005 he became a Senior Lecturer and in 2013 he was promoted to Reader in Photonic Technologies, a post which he still holds. Dr Koutsogeorgis' research interest is in the area of Material Science. Specific areas of interest include thin film technology, laser processing, luminescent devices, plasmonics, electronic devices, smart coatings. The materials and processes he is developing and studying have numerous applications in the area of nanotechnology, spanning several industries including those of photovoltaics, data storage, security and authentication, optoelectronics, thin film transistors, displays, optical coatings, laser machining and laser prototyping. Currently he is leading the Electronic and Photonic Materials Group. His research focuses on the areas of thin film technology for Plasmonics, Phosphors and the Semiconductor Industry (semiconducting oxides and transparent conducting materials). The main theme is Plasmonic thin films, a rapidly growing research area, demonstrating great potential for high societal impact in the near future. His research group benefits from long standing expertise in thin film technology and laser processing of thin films. The main focus of its work is in developing optical coatings comprising hard wearing and long lasting dielectric thin films with metal nanoparticles of controlled size and density embedded in them. He has developed, at NTU, a unique technology with which the group can achieve subsurface modification and control of the nanoparticles, (size and density,) for engineering the surface plasmon resonance phenomenon into applications. Also, phosphor thin films can be developed as the light emitting layer for electro-, cathode-, and photo- luminescent devices. Our unique laser processing technology provides durable thin film layers of phosphor materials with brighter light output and longer lifetime under a range of different excitations. Finally, development of oxide thin films for the semiconductor industry is concentrated around thin film materials suitable for transparent and flexible electronics. The laser processing technology is capable of controlling the properties of the thin film materials and result in the fine tuning of their semi-conducting characteristics. Since this is a low temperature process, it is compatible with low cost, flexible and transparent substrates. Opportunities to carry out postgraduate work towards an MPhil / PhD exist and further information may be obtained from the NTU Graduate School. Dr Koutsogeorgis is a member of the organising committee of the International Conference of Nanosciences & Nanotechnologies (workshop 2). He is a regular participant in other international research conferences like the E-MRS, MRS, TCM. Additionally he works closely with several industrial collaborators (internationally) with the aim of transferring knowledge gained in academic research into industrial production and, at the same time, to identify academic research directions that are relevant, current and with high industrial impact.